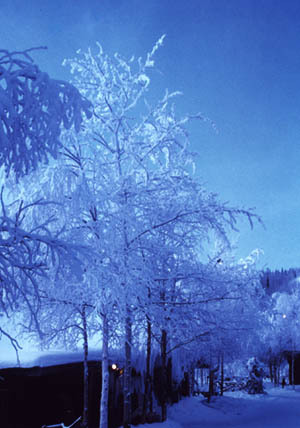 I go to a chena hot spring by bus from Fairbanks airport. Journey most arrive at a hot spring inn with an odd number for about 1 hour when they cannot see the outside with pitch-darkness. A lodge-like hut was a houseroom, and a lot of photographs of aurora exhibited the lodge of a receptionist even if I said a hot spring. I get a key of a room and put a load and carry machine parts and prepare aurora observation at once. A tour visitor set machine parts, too, but most returned to a lodge because aurora did not yet appear. 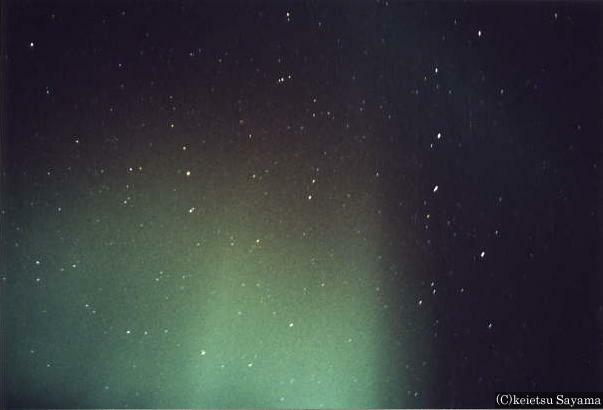 I and friend and several people held out till aurora appeared in an observation open space. I bought it and prepared for this day, but the finger-tip of a foot was still newly cold with heavy winter clothing and gloves and shoes of Eskimo specifications before the end of the year. Will temperature be around -20 degrees Celsius? I hold out, and an odd number just returns to a lodge soon for one hour, too and sleeps. When I thought of F, I saw an obi of absentminded green light. Though it watched the same place, I turned into clear form while adding to strength of light. This is aurora! 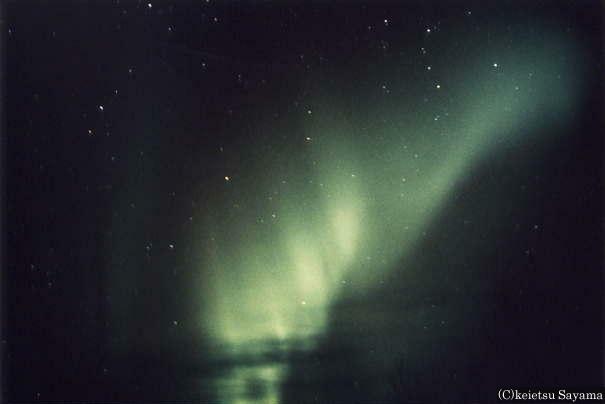 Aurora swung before long and opened in the shape of a curtain while showing the movement that rose to the sky. Because I must not forget me here, I photograph it by an exposure of 30-60 seconds. When I had finished taking it to about 6 pieces, I held out a little more, but aurora was not turning up after all, and, as for the aurora, observation finished ToT which disappeared to a north distance afterwards. At the same time, the people whom it overwhelmed in a lodge came out to an open space, but it was too late. 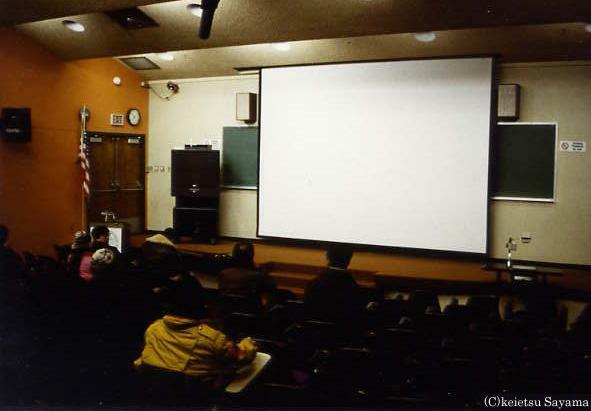 There was an option tour of Fairbanks city sightseeing from a tour conductor, and I who woke by the sound that a door of a room was knocked on intensely on the next morning heard that I left it to hear a lecture of aurora at Alaska university. Though I applied beforehand, a head was half-asleep for success and a sense of relief of observation, but I got ready and at last got on a bus. Because departure was late because of me for 30 minutes, I apologized to a participant with a flat body low head. zzz which seems to have decided the friend seems to have been considerably sleepy, and to just sleep. The bus departed just after dim light. The sunrise of Alaska is AM10:11 Sunset is PM4:00. I saw only coniferous trees and snowy scenery from the car window. The sun rises diagonally. 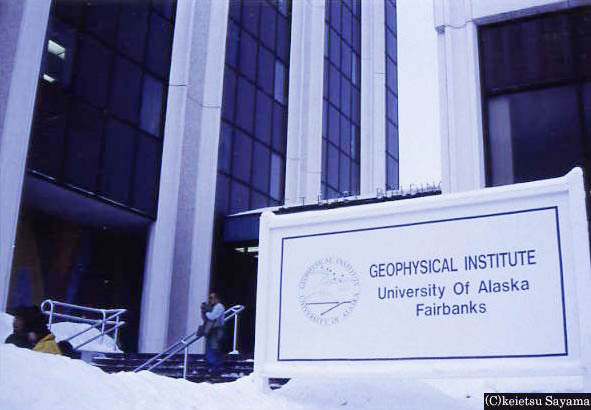 I did not enter the city of Fairbanks, and there was Alaska university in the place that went to the suburbs. It is let go through before long from the large yard by a lecture room. The chair which a bed was made diagonally, and was purple was impressive. 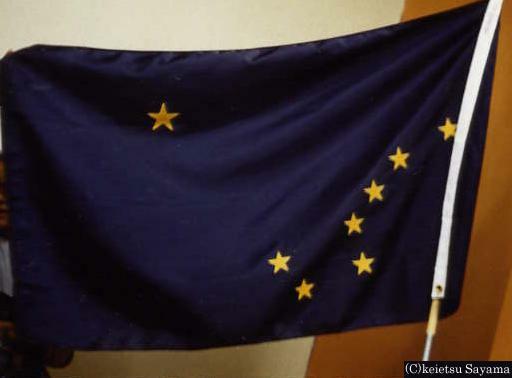 Alaska state flag is displayed in a classroom, too. A star of the Big Dipper and the polestar was drawn in a place of dark blue for money, and it was a conspicuous flag. People of an optional tour gather entirely, too and wait for a professor. Then a gentleman past middle age appeared. 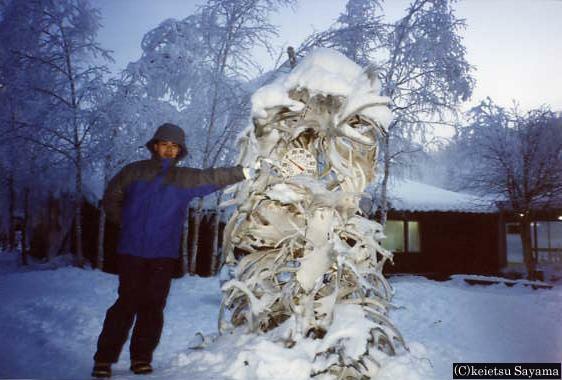 He does a birch for another 30 years and works as a director of Alaska university earth physics laboratory. A name is Shunnichi Akasofu. A demeanor is very soft one. I was red, and I was small, and it was explained with the light which shined while watching a photograph by a slide prepared for beforehand. Nothing used a flash bulb with a valuable photograph and took a slide by holdings photography. 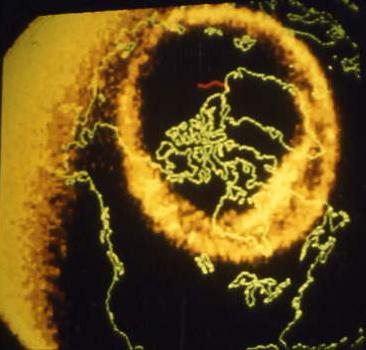 "Aurora occurs by heart on the stratosphere, and the base extends to a top to height of 400km at 120km". 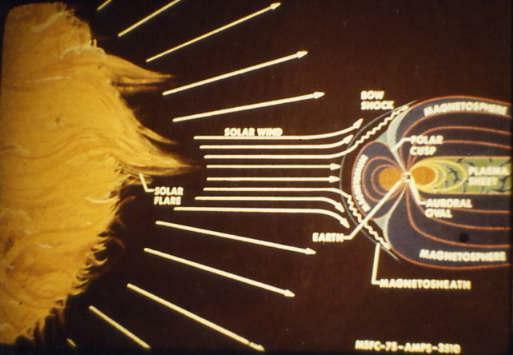 It is it with aurora, and we can consider it a particle to call solar wind to gush out of a solar corona collides with the atmosphere in the magnetosphere of the South Pole / North Pole neighborhood of the face of the Earth, and to give off light. It is distribution of aurora, but the Northern Hemisphere has north magnetic pole in the northwest of Greenland, and aurora occurs in the vicinity of a radius of 3,000km concentrically around here. Aurora occurs in the vicinity of a radius of 3,000km likewise around a gulf of the South Pole Ross Sea west in the Southern Hemisphere. Other than such an explanation, explanation of stratum distribution of Alaska was considered to be it, too. "South American stratum gets on a continental plate on a global scale in the southern parts of Kodiak Island or Anchorage of State of Alaska, and it is carried, and there is stratum around the Arctic Ocean in stratum around the North Pole". The place where stratum fellow collided with became Alaska Range around Mount McKinley The solar photograph which rolled on the horizon was introduced. 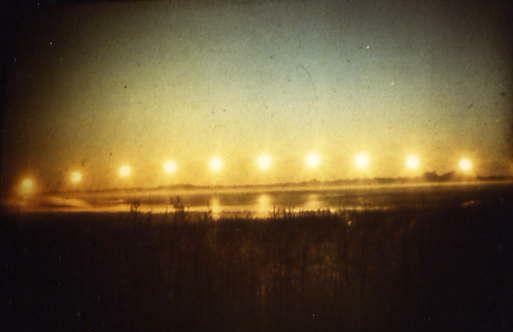 It was the photograph which photographed the sun of winter solstice every 30 minutes, but the sun seemed to really roll. When explanation of aurora left an end classroom, a day was about to already go down. 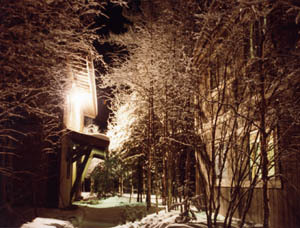 I return to a lodge of a straight chena hot spring without going along Fairbanks city. The supper tasted a meal of a viking method. 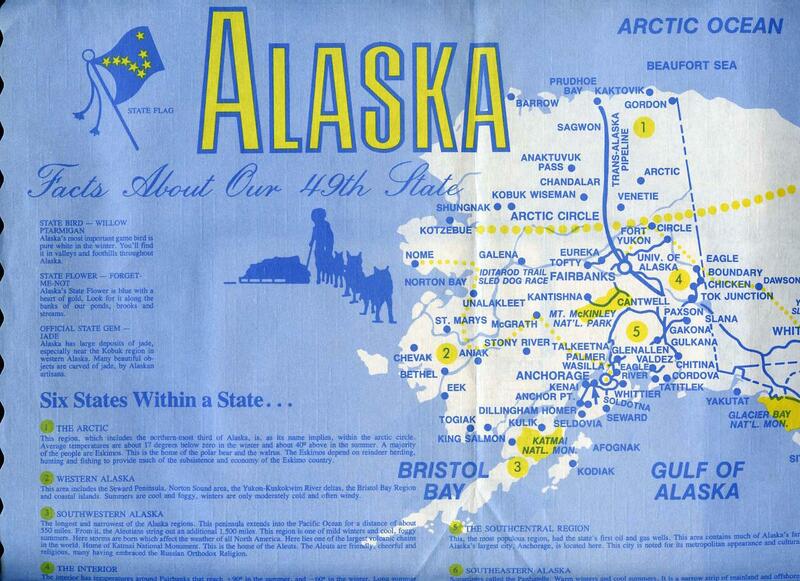 In the restaurant of here, a map of State of Alaska was used for luncheon mat, and good ^o^ which took several pieces home with because it was memorialized of a trip watched aurora again in the evening, but light was weak all, and only cloud and a shaft of light which I did were seen. 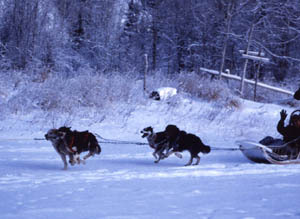 I participate in an optional tour to be carried on a dogsled on the next morning. 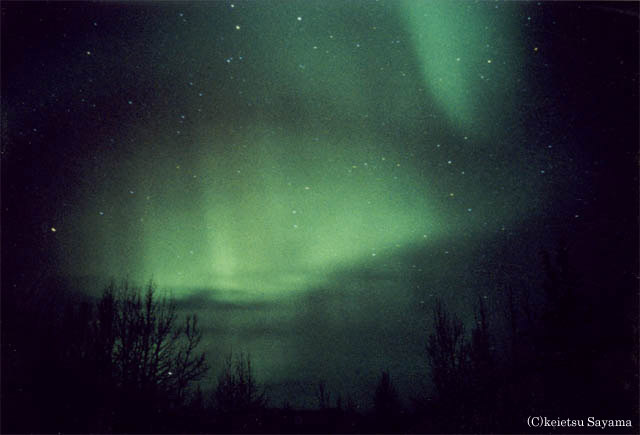 The open space that a dog runs is the place that watched aurora. I was in the middle of appearing in an open space and took it because it was beautiful that ice stuck to a tree by the steam of a hot spring. The point that the water which remained of a hot spring flows through is a near lake. I step on a dogsled while watching the clear sky. Because my turn was the last, I took the photograph which all of you stepped on. At last it is my turn. A dog saws a sled in eight of them. A sled begins to be attracted by a signal of the master and goes around about approximately 1km course. The dog which I looked at each other while taking out a tongue, and advanced was impressive. The chena hot spring had a smell of sulfur in a sulfur spring to some extent, but did not enter a public bath because I was absorbed in aurora. There wears a swimsuit, and enter; seem to be selected. Because hot water of a shower was a sulfur spring, the hair washed a houseroom of a lodge with water. I go to Anchorage by air today from Fairbanks. I observed a station of the Alaska railroad which I wanted to step on by Anchorage city sightseeing once. I remembered that it was used at a location when I ran through Alaska by an American crossing ultra quiz in a few years ago. I really get and want to travel this time.